Your ultimate guide to walking, hiking and slackpacking the Wild Coast of South Africa in the Eastern Cape. 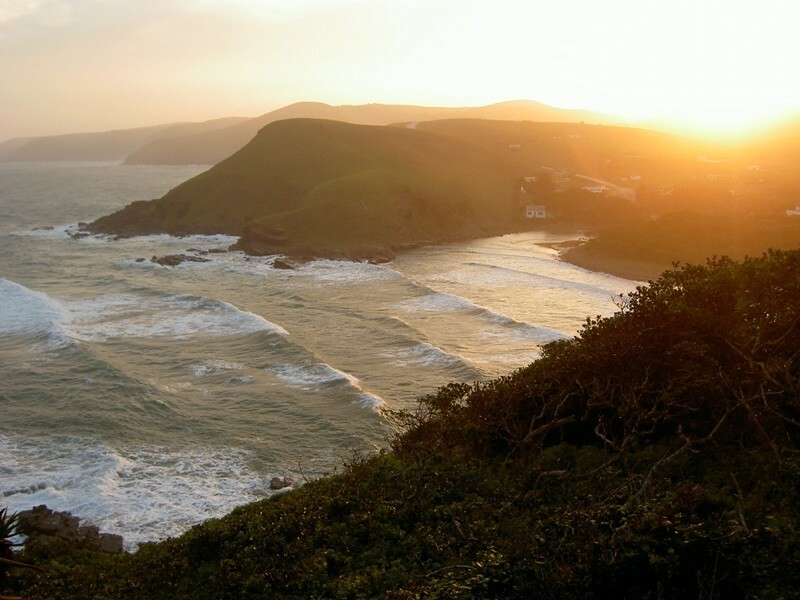 The territory of the Wild Coast is one of those relatively unexplored destinations wrapped up in wonder and a road trip in this region is ideal to bring you closer to the unknown. But what if you could tread even deeper into the unfamiliar? What if you could explore a path where no car – not even a 4x4 – would ever be able to go? What if you could get a different glimpse of the destination as you stand directly under the forest canopy, as you navigate through rivers, into villages and get closer to secret waterfalls? Well, pull up your socks and grab your hiking boots because you can! There are numerous day hikes and overnight trails – from slackpacking to carry-your-own-clothes-sleeping-bag-and-food – in the area, perfect for families looking for a leisurely stroll, adventurers seeking some bundu bashing and everything in between. 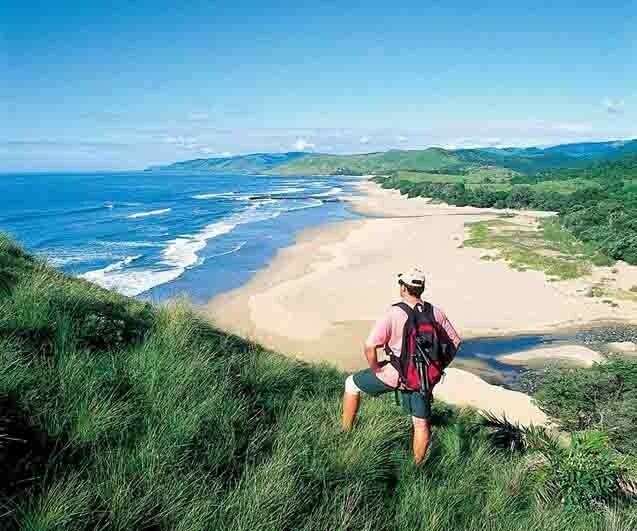 The Wild Coast Meander is South Africa’s first slackpacking trail and avid hikers (as well as families) have been meandering along this 5-night/6-day trail since 1998. 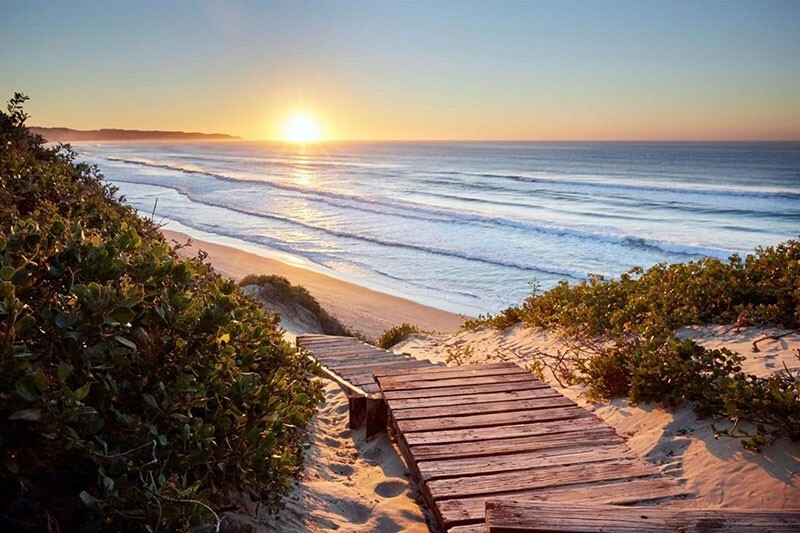 The 56km route – which takes you along the coastline from Kob Inn to Morgan Bay – has plenty to offer from shipwreck sights to remote locations visiting coastal resorts such as Mazeppa Bay, Wavecrest and Trennery’s along the way, where you can put your feet up in comfort. The terrain is easy-going, you can hire a porter and the guides – male and female - from communities along the meander, is the cherry on top of the experience as they share interesting facts and their local expertise and traditions. 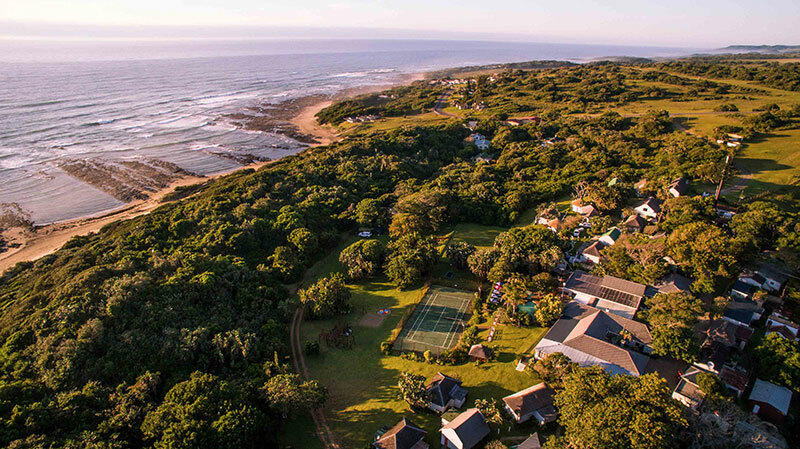 If you want to have your bread buttered on both sides with a bit of beach, a slice of Xhosa tradition and a bit of bush, then the 5-night Wild Coast Amble of 55 km is perfect for you; stay in luxury tented camps, enjoy a game drive, a cultural visit and wander along the beach. There are also road transfers available for non-walkers. 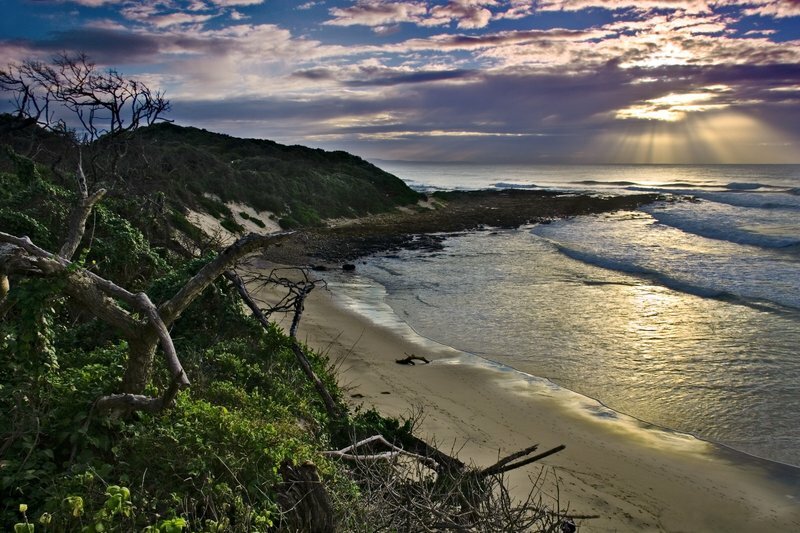 *You can combine the Wild Coast Meander with the Wild Coast Amble; if you choose to combine the two (5-nights/ 6-days) you will still experience the diverse scenery but skip the strenuous bits. It is a no-brainer why everyone wants to witness Waterfall Bluff when they first hear about it. Waterfall Bluff is one of only 19 waterfalls world-wide that fall directly into the sea, and it is believed (but not entirely true) that there are only two such waterfalls on the African continent; of course viewing something so special takes some extra effort and special arrangement as getting there quickly and easisly with a car is not an option. The best way to view Waterfall Bluff is via a guided hike from Mboyti River Lodge. 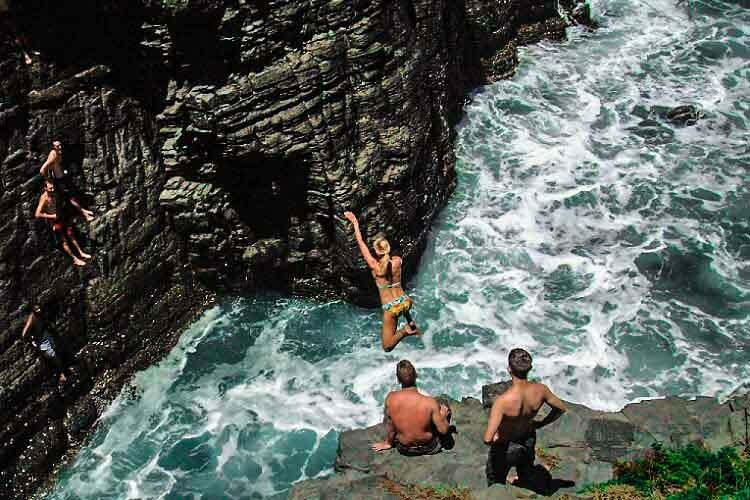 It is a full day hike of 28 km and your guide will show you some extra sights along the way, such as the Cathedral Rock (another hole in another wall), Grotto Cave and he will let you in on a few secrets… did you know that there is another waterfall plummeting into the ocean by the name of Mfihlelo Falls? 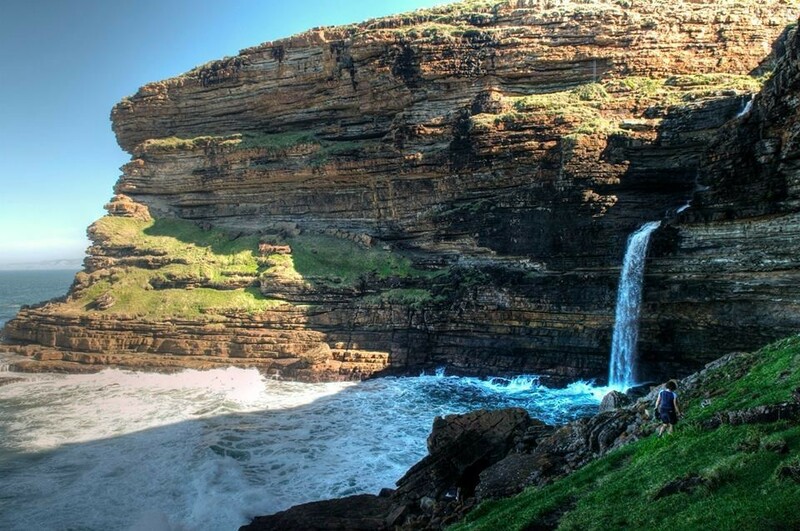 It is not listed as a waterfall that falls into the sea and shhhh, it’s one of the Wild Coast’s best kept secrets. For those who don’t want to do a 28 km hike there is also the option to drive about 45 km from Mboyti, with a 4x4, to Luphatana; from there it is a 4.5 km hike to Waterfall Bluff and another 3 km to Cathedral Rock (13 km in total). Make Mboyti River Lodge your base and set out every morning on one of four four different guided hikes that will take you over and through some strenuous, yet spectacular, terrain of indigenous forest to cliffs and waterfalls, and give you a glimpse into the lives of the Pondo people. Those overnighting at Mboyti River Lodge can also set out on some guided day hikes which range from moderate to difficult, from 11.5 km to 28 km. 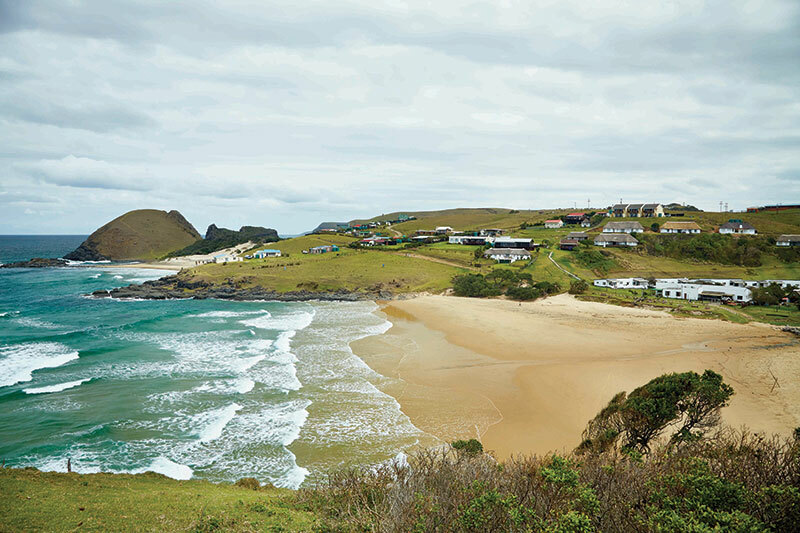 Forget about food or sleeping bags and get into the heart of the Wild Coast’s rural side: pack your bags for the 60 km, 5-day guided hike with jaw-dropping landscapes during the day and local homesteads at night. This hike is about more than just the kilometres, it's the experiences that make it a one-of-a-kind trail: such as learning about Xhosa culture, traditions and enjoying traditional home-cooked meals with Umqombothi, uMngqusho and your host’s homegrown veggies. 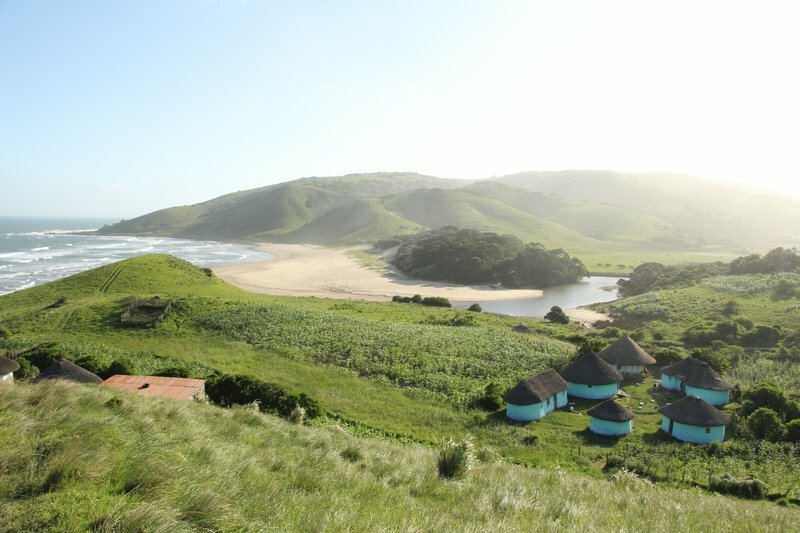 You can also drop a line in the water to fish, visit a Sangoma or herbalist, learn isiXhosa and, as you walk along the grassy hills, you might even spot some whales as well (depending on the season). If you don’t have enough time for an overnight trail on the Wild Coast but still wish to experience the area on foot, consider navigating your way from Coffee Bay to Hole in the Wall on a 9 km (3-hour) hike to witness the wonder that is ‘esikhaleni’. ‘Esikhaleni’ – which means place of sound – is the phenomenal rock formation towering out between the ocean and the Mpako River and hikers will be treated to sights of colourful villages, the ever-magnificent wildest coastline of South Africa, the ‘Baby Hole’ and also Hlungwane Waterfall. Pack a bathing suit and some lunch to be enjoyed at the lagoon where the hike ends and head back to Coffee Bay on four wheels… or if you wish to do it all over again, you can also return the way you came, on two legs. Coffee Bay has a lot to offer and if surfing is not your strong point, you can always trade your flip flops for something sturdy with laces and do a hike or two. The Mpuzi Cliffs and Cave trail is a guided 5 km hike from Coffee Shack Backpackers that will take you on some goat paths along the Mpuzi Cliff edge, to caverns, the Bat Cave and secret pools. You will have to do a bit of rock scrambling but you will get treated to lunch and, if you are feeling brave, you can do a cliff jump into the Mpuzi River! 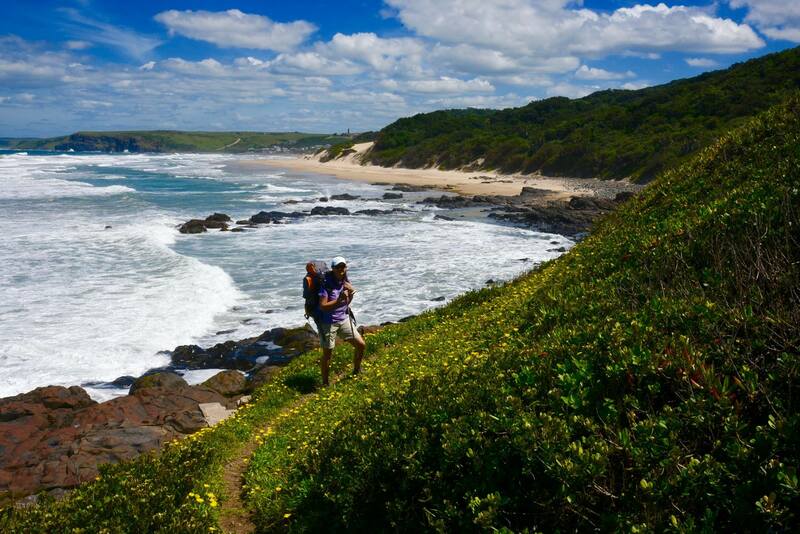 The 57 km Strandloper Trail is a 4-day hike in the southern section of the Wild Coast, starting at Kei Mouth and ending at Gonubie. The trail takes you along stretches of unspoilt beaches, over rocks, grassland and across rivers with a mix of rustic huts sans electricity to a slice of civilization on the side allowing you to ditch multiple 2 minute noodle meals for more real food and a few giant cold ones. Keep in mind that this trail is a do-it-yourself hike; it is unguided, you have to prepare your own meals (there are some shops along the way as well as the Haga Haga hotel) and you have to be aware of the tides and be prepared to swim and put your backpack in a watertight bag as you’ll cross the Quko, Kwenxura, Kwelegha and Gonubie Rivers. Don’t feel like carrying your own pack, shivering under a cold shower or sharing a bunk bed with a snoring hiking mate? The Sundowner Trail is the 4-night and 5-day laid-back version of the Strandloper Hiking Trail which takes you from Trennery’s to Chintsa East and is all-inclusive (dinner, bed, breakfast, picnic lunch for the hiking days, shuttle costs and baggage transfers). The hike will take you to interesting sites such as the Jacaranda shipwreck from 1972, the world-renowned Hazel Jefferies shell collection and Morgan Bay’s cliffs. The total distance of the trail is 55 km. Keep in mind that the Wild Coast is called wild for a reason and the roads can get a bit bumpy; something with a higher clearance is recommended and for some – or rather most - roads you want to make sure that you have either a 4x2 with difflock or a 4x4. Always check that your spare tyre is in a working condition and if you are going off-road make sure to pack the necessary recovery gear. Livestock roam the streets, take caution when driving. 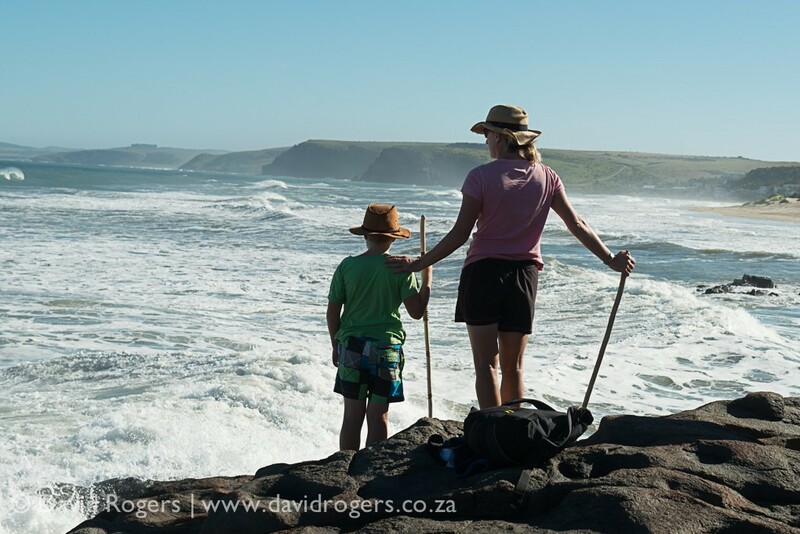 Sunscreen, good walking shoes, insect repellant and something warm should always accompany you to the Wild Coast. Be aware of the tide when crossing rivers and be careful of currents and crossing too close to the river mouth. Safety is key when swimming in the ocean; be on the lookout for treacherous currents and high waves. Be respectful of other cultures, customs and traditions; always ask before taking a photo of someone. Obtain the necessary fishing permits before casting a line. 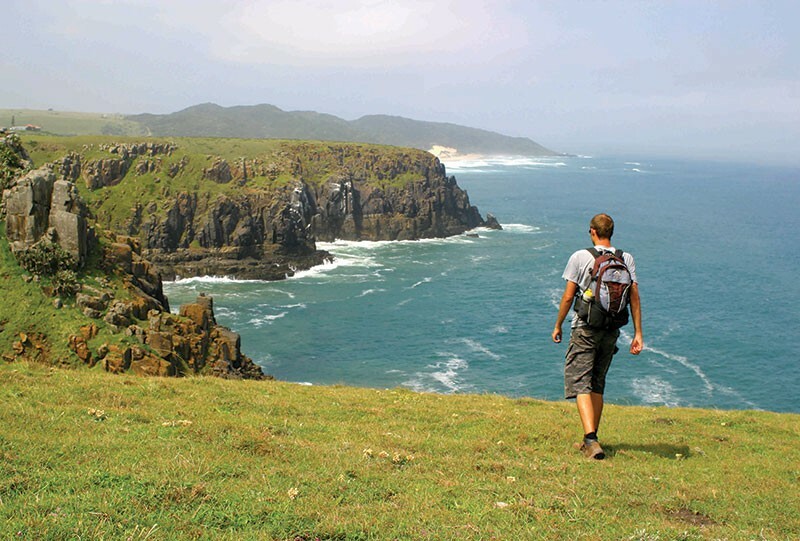 There is a 25-day hiking trail that stretches from the Umtamvuna River in Port Edward to Qolora Mouth, north of the Great Kei River; the trail is open-ended and depending on circumstances such as fitness and weather, the trail can also be done over less or more days and can be divided into sections. If you’re feeling like 280 km remember to get a permit from the Department of Agriculture and Forestry.